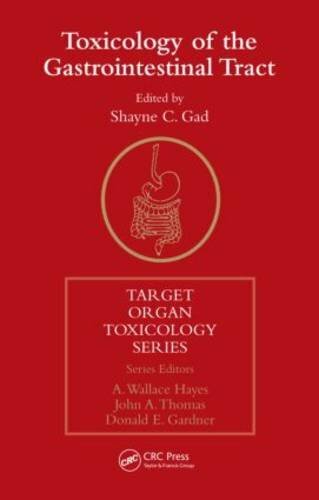 [PDF] Toxicology of the Gastrointestinal Tract (Target Organ Toxicology Series) | Free eBooks Download - EBOOKEE! Description: Toxicology of the Gastrointestinal Tract focuses on the specifics of the mechanisms and adverse effects of xenobiotic agents and pharmaceuticals on the structure and function of the GI tract. The book focuses on a number of specific areas of intestinal research. Beginning with the well-recognized and major functions of nutrient absorption and its role as a protective barrier, the text elaborates on the expanding body of knowledge that relates to the intestines as a major metabolic and immunologic organ involved in the synthesis and degradation of both natural and foreign substances. It includes an overview of the function and dysfunction of the human absorptive process and the effects of microbial flora on these processes, as well as specific classes of toxicants that target the GI tract. The international panel of contributors presents a critical appraisal of the interactions of chemicals and drugs with the gastrointestinal system and the experimental methods and regions of research on which to focus future efforts. Providing a complete and multidisciplinary overview of the gastrointestinal system both in health and as it is involved in the toxicity of exogenous agents, Toxicology of the Gastrointestinal Tract brings together the current and growing knowledge of this critical organ system in a single volume. No comments for "[PDF] Toxicology of the Gastrointestinal Tract (Target Organ Toxicology Series)".